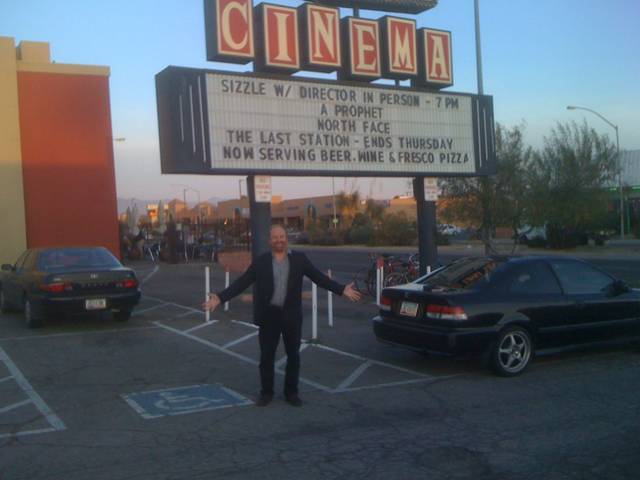 THE LOFT CINEMA IN TUCSON, ARIZONA: BEST SIZZLE SCREENING EVER! 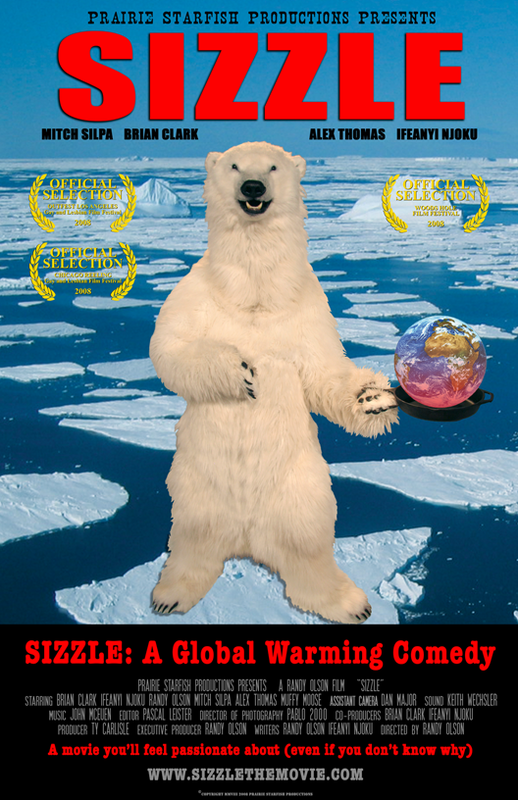 A nice tradition has arisen this spring — the showing of our movie, “Sizzle: A Global Warming Comedy,” in association with Earth Day on April 22. “Flock of Dodos” has pegged itself to Darwin Day, February 12. Now Sizzle has it’s own time of the year. Cal State Northridge — still in the works, Ifeanyi Njoku will attend. 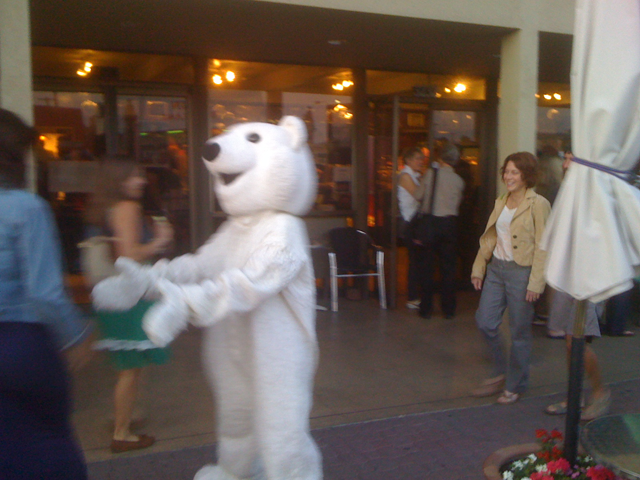 The movie takes on a little bit of a different feel in this post-Climategate era. 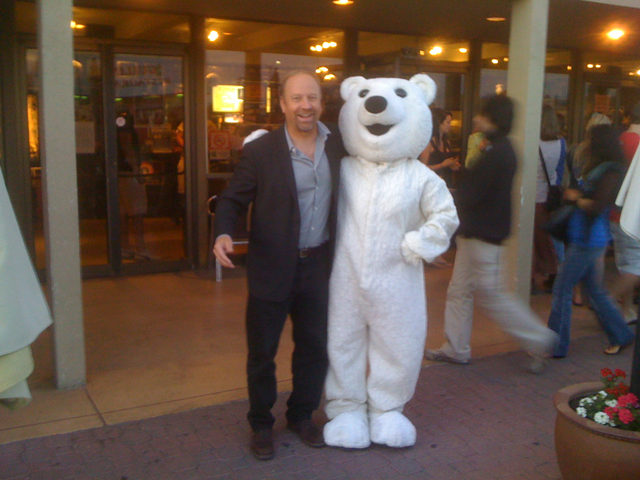 In the summer of 2008 when it premiered, a number of people in the science and environmental community said lovely things to us about the “disservice” we were providing by “giving a forum to” the climate skeptics/contrarians/denialists/anti-scientists (nobody can seem to come to a consensus on what to call these people). Things feel a bit different now. Marc Morano is featured in a flattering EIGHT PAGE profile in Esquire magazine this month (once again, thank you to all the people who wrote in a couple weeks ago claiming I had been “used” or “suckered” by Marc Morano — as though we were giving him his “big break” here on The Benshi — we all know the circulation of Esquire is only a couple dozen while millions are now reading The Benshi). Pat Michaels (also in “Sizzle”) called Climategate, “Not a smoking gun, but a mushroom cloud,” and proved to be fairly correct. And most people now seem to at last be willing to concede that the “ignore them and they’ll go away” strategy didn’t pan out so well. 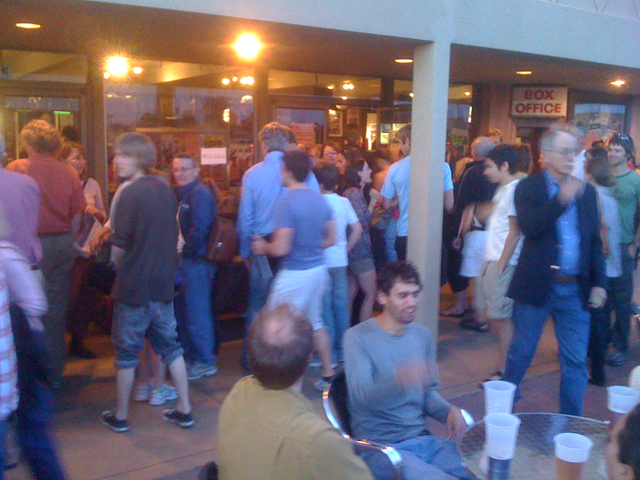 So here we are, two years later, with the only movie that gives voice to both sides of “the controversy.” And you can try as hard as your literal mind wants in claiming “there is no controversy,” but come on, at some point, when it is ALL over every possible news outlet …you finally have to switch gears from reality to perception and concede, “Okay, you guys were right, there IS a controversy.” Just look at Tuesday’s front page article in the NY Times about how most meteorologists are climate skeptics, and most average people get their climate news from them. 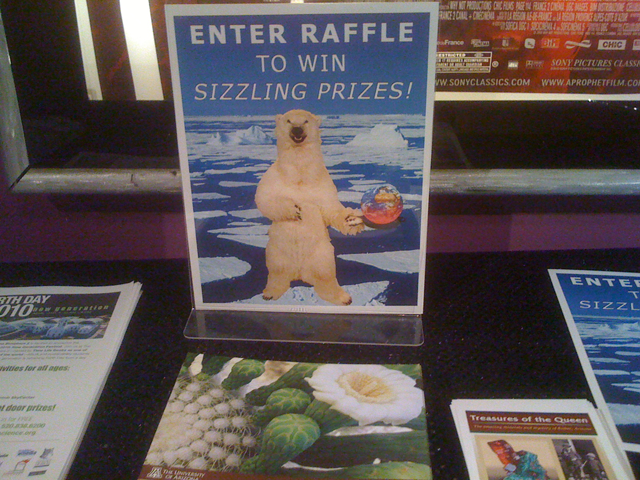 “Sizzle” is the only movie that gives you a glimpse of this controversy, has some fun along the way, TELLS A STORY, reaches into your heart to show you the painful seriousness of climate disasters, and culminates with an audience that wants to learn MORE about the issue, rather than run for the exits. 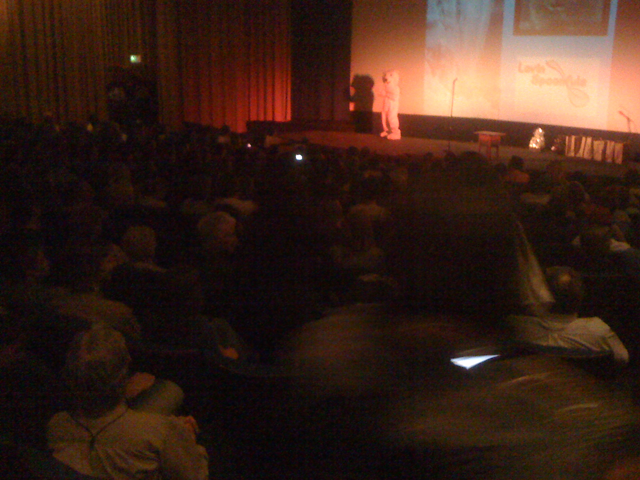 It’s always amazing how few people leave after the movie, and how many hands go up when it’s time for discussion. We’re going to have a lot of fun with the screenings this month. 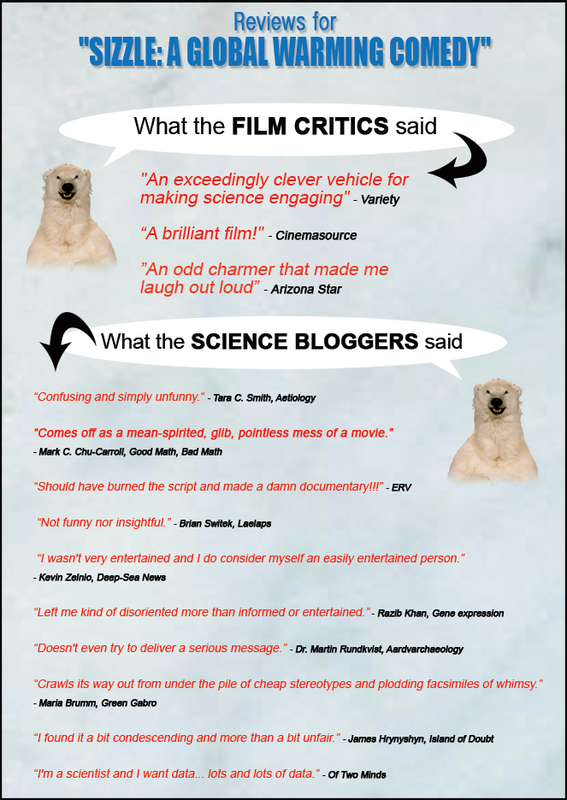 And in the meanwhile, just to get everyone in the mood, here’s a blast from the past — a summary of what the “critics” had to say about the movie. See if you can spot any pattern.